Need a quick and easy meal for a busy weeknight? Try this Indian-inspired Chicken Masala. Tikka masala sauce, while scrumptious, isn’t particularly heart-healthy so I only have this dish on special occasions when I’m lucky enough to be near a good Indian restaurant. Chicken Masala captures the essence of the chicken while eliminating the unhealthy sauce and is a snap to prepare, especially if you don’t have a tandoor oven. 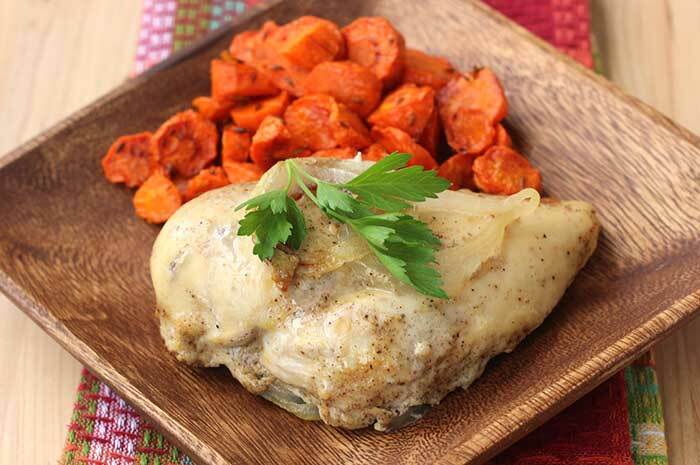 The yogurt makes the chicken exceptionally moist and flavorful. The main thing to remember about this recipe is that the chicken needs at least a couple of hours to marinate. Do the first step in the recipe below before you head to work in the morning, then all you’ll need to do when you get home is slice an onion and turn on the oven. What could be simpler? Make some Cumin-Roasted Carrots and Cucumber Raita and you’ll have a complete meal. What do you like to order when you go to an Indian restaurant? In a small bowl, combine yogurt, cilantro, olive oil, garam masala, salt, and garlic. Mix well. Dip chicken breasts in yogurt mixture, then place them in a large gallon-sized zip-top plastic bag. Pour remaining yogurt mixture over chicken, then extract as much air as possible before sealing the bag. Make sure the yogurt completely coats all sides of the chicken. Refrigerate at least 2 hours and up to 24 hours. Preheat oven to 400°F. Arrange onions in thin layer on baking sheet, then place chicken breasts on top. Space the chicken so that the pieces do not touch. The chicken should still be coated in some marinade; discard the rest. Roast chicken for about 40 minutes or until it is cooked through. You want it to be at about 165°F. Start checking the temperature after about 30 minutes. Serve with onion slices. The nutritional information is a bit misleading (e.g. Sodium) because some of the marinade is discarded and not consumed. If you are watching Sodium, you might not want to add any kosher salt at all. I was just craving Indian food the other night! This looks so easy and delicious! My absolute favorite thing at any Indian restaurant is the spicy cilantro jalapeno sauce. I could eat it on everything! Can’t wait to try this out! Just ordered an Indian cookbook – hoping it will have a recipe for the cilantro jalapeno sauce. I love it too!